Chih-Hao Chiu is currently a senior undergraduate student in department of photonics at Feng Chia University in Taiwan. At the same time, he works in Professor Hui-Yu Chen’s group and his research interest is “observation the influence of the physical properties of the nematic host on blue phase”. His major experimental setup is a crossed polarizer microscope. Through it, he enjoys observing and recording the beautiful images of the liquid-crystal materials, especially the blue phases. 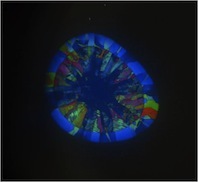 The picture shows the blue phases formed by mixing the 25wt% chiral dopant R811 into the nematic liquid crystals. The image displays three blue phases, BPIII, BPII and BPI from outer to inner region. On cooling from isotropic phase, the BPs existed in a wide temperature range of 12 K. The cell gap was 11 µm, controlled by the ball spacer and no surface treatment was done here. The picture was taken on an Olympus BX51 polarizing optical microscope with 10X objective and Olympus digital camera E620. Jury comment: This picture was selected because of its beautiful depiction of the blue phases, also showing the transitions between them.